Not to boast, but you’re looking at a good little piece of writing here. Wouldn’t it be nice if you could call it your own — and more to the point, nobody else’s? That’s precisely why you need a service to check for duplicate content. Basically, duplicate content checking apps take your text and scour the Internet to see if that specific combination of words and phrases is already out there. The need for unique content has been a big part of the SEO toolbox for years; you simply can’t get any respect from search engines if your site doesn’t offer something different. And if your content is something that someone else owns, Google may be the least of your troubles. Verifying unique content is even more essential now that guest posting is in the middle of a debate. Perhaps you’re managing a site that publishes guest blogs, and you need to make the process of verification a bit more efficient. Or maybe you’re an author of guest posts who would like to see where your work has ultimately been published and if it has ended up in multiple places, under multiple names. Note: this is slightly different from optimizing the uniqueness of a given article, or comparing the similarity between two existing URLs. Some of these methods can certainly accomplish these goals, but these five picks are specifically geared toward checking for existing duplicate content, quickly and for free. Many free duplicate content checkers are merely frontends for Google Search anyway, so why not go to the source? Especially if you’re familiar with quotation marks and Boolean operations. Google can be a handy, flexible, and powerful way to reveal sites that post your writing. The downside is that you’re limited to 32 words, which can be a severe drawback in some cases, and obviously it won’t give you any sort of useful “uniqueness” statistics. An impressive no-nonsense plagiarism checker that uses Google, Yahoo, and Bing search engines as well as dedicated searches for Google Scholar and Google Books. Every tier of Plagiarisma’s services is free, but you’ll have to register to get the best parts (which include the “Synonymizer” content spinning tool as well). Your results may vary if you select the “Google” option, but most of the time, I find DupliChecker to be more than sufficient to track down similar content using “Yahoo” and “MSN” (which both use Bing’s excellent search API). You’ll get useful filters, as well as the ability to see how different the top result is from the next-closest. Is it mainly a search engine frontend? Yes, but a more convenient one than most. Plagium belongs on any duplicate content checking list (short or long, free or paid). The free version of the service is limited to 25,000 characters at a time, but that’s ten times the size of what you’re reading right now. Every so often, Plagium will miss published content that I know is out there, so I feel safer with a backup option to verify any “no plagiarism found” results. The most-used plagiarism checker : Copyscape. The good news is that the basic URL checker is still 100% free; the bad news is that it doesn’t provide you with much in the way of pre-publishing/offline content uniqueness tools. For that, you’ll have to move up to the Premium tier, which gives many other features [http://www.copyscape.com/premium.php] for $0.05 per search. What service do you use to check for duplicate content? Do you often check for plagiarism of your blog? 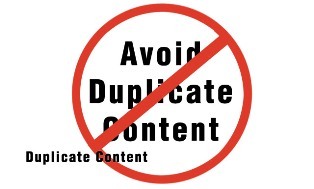 Duplicate contents is not a viable strategy in blogging and can make you get something for the time being. Sooner or later you will fall flat once the real owner of content notice your piracy and report it to content management authority. But many bloggers don’t know that this does happen sooner or later and keep pirating others contents and eventually become a bloody copycat. Unfortunately after having been fined or penalized once they can never bounce back as content marketer because stigma on online reputation can never be washed and people never rely on such people. Thanks a lot Erik Emanuelli for sharing such a wonderful list to find duplicate contents and keep the contents safe from the curse of piracy. that’s why it’s not suggested to copy the content not yours. Nice to hear about such important duplicate content checking tools from you. Now a days number of duplication is increasing and increasing. These tools can help us greatly to identify the quality of any content. Thanks for sharing. Another great write. For me, I love CopyScape but it is slightly costly if you are a heavy duty type. Not heard much about the rest but certainly going to check them out. Looking pretty amazing and promising! Keep sharing plus the good work mate! One time per day without registering, or any search you need if you log in. Thanks for sharing the duplicate content checker tools. I basically use Copyscape but it is slight costly so I would surely try out the other tools you have mentioned above. Good to know you learned about some new interesting tools from this post, Sarmista. now you learned a lesson from that experience! Thanks for shearing too informatics knowledge regard duplicate content checking services. I use Plagiarisma tool as duplicate checker tool. Also a tool which is useful and not mention in this content that is dupeoff tool. thanks for adding Dupeoff, seems nice. Now i got the important tools needed for me from this informative post. Before reading this post, i only knew about copyscape. Keep doing. I have a doubt, there are so many blogs dealing with same topics. So that there should be many similarities between those posts. They may have made it without referring others. Yet there would be some similarities especially the words they used in the post. Does google consider it as a duplicate content? Is there any proportion for Google in the case of duplicate content? Just make your tests using the tools mentioned in this post, you’ll see. not just few similar words in the same text. Thanks for commenting her,e Sanjay. Copyscape is my favorite tool to check articles for plagiarism and sometime I feel like they must provide an O.S based application. Thanks for sharing other duplicate checker tools. Thanks for sharing your views, Gordan.